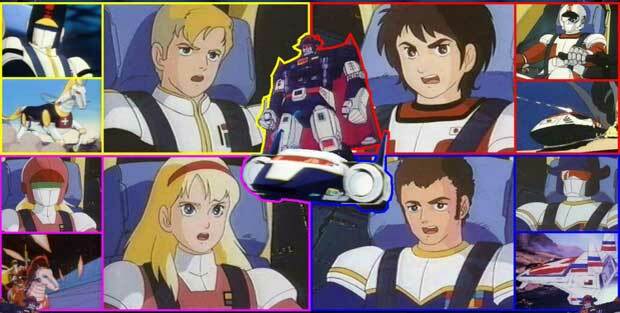 Clockwise from upper left: Richard Lancelot, Shinji Hikari, Bill Wilcox and Marianne Louvre. In the center: Bismarck. Sei Juushi Bismarck is the story of four space explorers stationed on Ganymede, a moon of Jupiter. Their goal is to protect our solar system from the Deathcula imperium. Although not as popular as Saber Rider and the Star Sheriffs, an Americanized (and arguably Macekred) dub produced by World Events Productions, it is more sophisticated—and unlike Saber Rider, it does have action figure toys in its own country. Big Red Button: Shinji's console has the button that converts the Bismarck from space cruiser to giant robot. Casanova Wannabe: Bill Willcox, although he proposes to a woman named June. Childhood Friends: Marianne and Shinji have known each other for years, and she actually went to Ganymede to find him because her father decided he was the best fit to be Bismarck's main pilot. Combining Mecha: Some of the Deathcula mecha turn out to be these, usually disguised as ordinary vehicles. However, they also tend to be more fragile than the regular humanoid Deathcula mecha, as they can be destroyed by Bismarck's weaponry even without transforming. Commander Contrarian: Bill to Shinji. Bill generally prefers straightforward tactics while Shinji pays more attention to what their actual mission parameters are. Bill usually backed down once the plan is actually explained. Cool Car: Shinji's Red Leon. Cool Horse: Richard's steed Donatello. Cool Plane: Bill's Arrow Striker. Cool Ship: Bismarck itself. Besides being a powerful warship, it's also able to function as a reasonably comfortable home for the Bismarck team. Darker and Edgier: Compared to Saber Rider and the Star Sheriffs. Deathcula disintegrate upon death (rather than being sent back to the Vapour Zone as in Saber Rider), and there are multiple reaction shots of people both human and Deathcula screaming as they're consumed in explosions. There are also several on-screen shootings of people. The Big Guy: Richard Lancelotnote Although WEP's rewritten dub would have one think otherwise. In that version, Richard was portrayed as "The Hero" (he was the "Saber Rider" of the title).. Heroic Sacrifice: Shinjiro Hikari, Shinji's father, who saved the galaxy from the Deathcula's first invasion 15 years before the series took place. Humongous Mecha: Deathcula have several models that reappear throughout the series, making it clear they are simply another piece of military equipment rather than custom models. Bismarck's Battleload formation transforms it from ship mode to robot mode. Kick the Dog: Deathcula seem genuinely unable to not do this. Monster of the Week: Deathcula generally has at least one Humungous Mecha on hand to deploy as a last resort. This isn't always the case, though. Multinational Team: Shinji is Japanese, Bill is American, Richard is British and Marianne is French. This is reflected by the flags they wear on their Protect Gear. Red Oni, Blue Oni: Shinji is the Red oni while Richard is the Blue oni; although Bill has the blue armor, he's sort of in between. Reluctant Warrior: Marianne. When she first shot a Deathcula marine, she was disgusted. In another episode, she almost throws up when she hears the death screams of numerous Deathcula dying after the unleashes a load of Bismarck's missiles upon them. Shinji has to tell her to hold it together, at least until Bill could arrive and take over weapons again. Team Dad: Dr. Charles Louvre. Thrown Out the Airlock: In one episode, Deathcula forces attack a space station and kill everyone aboard, leaving the corpses floating out in space. In another, the Bismarck team wipes out a Deathcula bridge crew (including the fleet commander) by opening the bridge's viewport and sucking them all out into space. True Companions: The Bismarck team quickly become this, despite their rather rough first meeting. Was It All a Lie? : When Richard discovers a young woman he met and was smitten by turned out to be a Deathcula spy, he asks her this. She instead asks him to join her, and tries to kill him when he refuses. She's dead in seconds.